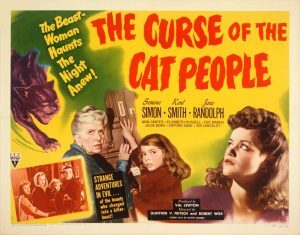 What it’s supposed to be: A sequel to the classic horror/suspense movie Cat People, directed by Robert Wise, telling the story of a child haunted by her father’s deceased first wife. It’s a psychological thriller with a child in the center. Why it’s a Christmas movie: A significant portion of the second half os this movie takes place at Christmas time. It’s a bit complicated when it comes to plot and how it connects with Cat People, the first movie, but basically a character who died in the previous movie now appears as a ghostly friend to the daughter of her husband. At Christmas, the little girl gets and gives a present to her ghost friend, and she also gives a present to her Sunset Boulevard styled actress friend who lives in the nearby creepy house. Thoughts: What a strange sequel. There are no “cat people” except the ghost of one, but the ghost has nothing to do with cats, really. The creative team behind the movie (producer and writer) return, along with some of the cast (the father and the ghost). It gets into some strange places with the creepy child who doesn’t fit in and who now ends up with a real imaginary friend. The only real similarities seem to be that people don’t believe the little girl who is visited by a ghost in this movie, and in the previous movie people didn’t believe the woman who believed she was one of the Cat People. Both turn out to not be lying. And then there’s the strange connection to the headless horseman in the climax. This thing goes all over the place.